Stephanie Dutkiewicz has been curious about the colors of the ocean ever since she set sail from her native South Africa to the Caribbean islands at age 17. Throughout the three-month long voyage, she noticed how the colors of the ocean changed from place to place. She understood the reason only when she took up oceanography in college. During her course, she learnt that that the ocean color shifts from green to blue due to the type and concentration of phytoplankton (algae) in that particular area. Since the algae uses chlorophyll, a green pigment, to produce organic carbon through photosynthesis, these ocean plants reflect light. The higher the number of phytoplankton in the ocean, the lesser the color blue and the greater the color green. Currently a principal research scientist in MIT’s Joint Program on the Science and Policy of Global Change and Department of Earth, Atmospheric and Planetary Sciences (EAPS), Dutkiewicz remains interested in these drivers of ocean color. For over 10 years, she and her main research partner, EAPS Associate Professor Mick Follows, have been guiding a team of a dozen MIT researchers and several collaborators from universities across the globe to advance the Darwin Project, which aims to model the growth, movement, and loss of phytoplankton around the world, the environments that they dwell in, and how they influence one another. Dutkiewicz is methodically probing phytoplankton behavior in order to arrive at what traits differentiate one of thousands of phytoplankton species from another, where various types are likely to live, and which types will survive and thrive under diverse environmental conditions. She was able to represent nearly a 100 different types of phytoplankton, guided by ship, laboratory, and satellite observations, in complex computer models that replicate phytoplankton population dynamics in the ocean and forecast how those dynamics will vary in the years to come. The results matched actual observations. These models, which are made up of hundreds of thousands of lines of code, are producing the world’s most multifaceted 2D and 3D universal maps of phytoplankton activity and ocean color. The maps are not only visually appealing; they also suggest insightful implications for the future of the Earth – ranging from the sustainability of the ocean’s food web to the rate of global warming. Since they are at the base of the food web, understanding which types of phytoplankton live where and projecting how these populations are likely to change will help us understand what will happen further up the food chain. And because the process by which these phytoplankton take carbon and sink it down into the deep ocean is responsible for storing about 200 parts per million (ppm) of carbon dioxide, they play an important role in the Earth’s climate system. In a current phytoplankton modeling research funded by the National Science Foundation, Dutkiewicz and Follows are analyzing a number of distinguishing traits and their potential influence on the planet. The traits identified so far include those based on size and those based on behavior, such as temperature tolerance, rates of nutrient uptake, and light tolerance. Size matters in the phytoplankton environment. Although all are microscopic, individual phytoplankton ranges in diameter from under 1μm to beyond 1,000μm — similar to the size difference between a mouse and Manhattan. When the ocean warms, it is anticipated that the upper layers of the ocean will interact less with the lower layers where nutrients are concentrated. Consequently, smaller phytoplankton, which can best withstand compromised nutrient conditions, are likely to overtake the number of larger phytoplankton, which are more efficient at storing carbon. This sort of change is likely to shift the oceanic food web to one centered on smaller phytoplankton as well as cause the decrease in the effectiveness of the ocean as a carbon sink. A majority of phytoplankton models, including those used by the Intergovernmental Panel on Climate Change (IPCC), typically resolve only two phytoplankton types: large and small. So when the ocean warms to a certain point in the future, the modeled phytoplankton populations seem to swing significantly, with small ones outnumbering large ones to a great extent. However, these shifts are expected to take place slowly in reality. To evaluate how the phytoplankton function and size will impact the climate, Dutkiewicz and colleagues designed a set of location-based grid cells representing the ocean. Each cell sized at a resolution that is fine enough to confirm the model through ship and satellite observations. a set of equations are solved within each grid cell, accounting for phytoplankton movement, growth, carbon cycling, loss and other population dynamics. Dutkiewicz has received funding from NASA, and is using the computer model to "ground-truth" satellite observations of phytoplankton concentrations in various parts of the ocean, which are based on the amount of light emitted from the ocean surface. Due to the presence of chlorophyll in phytoplankton, the light is reflected, thus absorbing more blue than green light. By calculating the amount of blue versus green light emission, the satellites approximate the amount of chlorophyll present at a particular location. 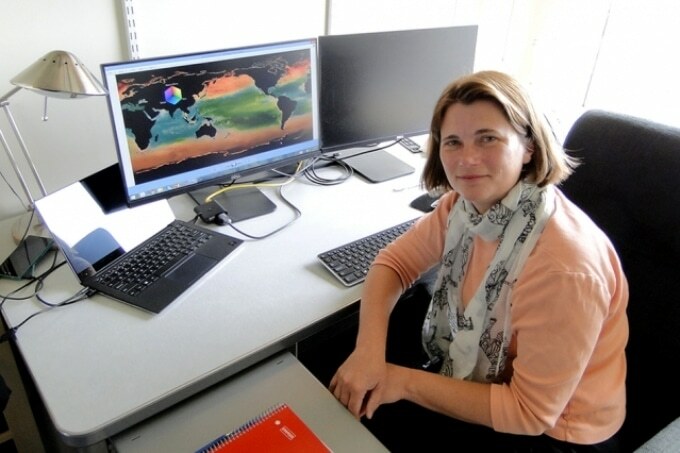 Such predictions are mostly crude, and hence Dutkiewicz is working to evaluate the level of ambiguity in chlorophyll ocean maps by indicating reflected light in her phytoplankton models. Her models generate true colors of the ocean as it is today, and project ocean colors covering the entire 21st century based on alterations in phytoplankton population dynamics. For instance, as the ocean warms and becomes highly acidic, phytoplankton populations will modify, thus changing chlorophyll levels and influencing the amount of light reflected from the ocean surface. Dutkiewicz’ career path as an oceanographer has exclusively positioned her to identify such signals. As a PhD student in physical oceanography at the University of Rhode Island, she initially focused on capturing ocean current movement. When she enrolled into MIT in 1998 as a postdoc in EAPS, she studied the way in which physics modifies the biology of phytoplankton, and constructed a numerical model of the marine ecosystem based on a single type of phytoplankton. Now modeling up to 100 times as numerous types, she is perhaps the most renowned expert in the world to explain not only why the colors of the ocean differ from one region to the next, but also foretell the future of the planet based on what those colors indicate.